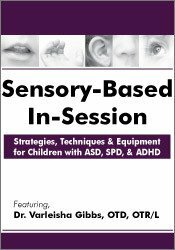 Join sensory and self-regulation expert, Varleisha Gibbs, OTD, OTR/L, and discover various sensory strategies, techniques, and equipment to use when working with children with ASD, SPD, and ADHD. The underlying neurological components will be reviewed to connect neuroanatomy to practice. Through live demonstrations at a sensory clinic, you will learn what types of equipment you should purchase for your clinic as well as their appropriate use, when to use them, and for how long. Video examples of children in a sensory clinic will be used to demonstrate correct versus incorrect methods including how to maneuver the equipment for the sought response as well as what happens when equipment is used incorrectly. A unique emphasis will be given to the neurological background, in relation to specific treatment techniques. Evidence-based practice will be an integral part of reviewing theories and current treatment techniques. Treatment techniques to be analyzed include: sound-based, movement, and vision-based therapies. Multi-disc DVD recording (1 hours, 53 minutes) with electronic manual and instructions. New York Educators: PESI, Inc. is an approved sponsor of CTLE with the New York State Education Department's (NYSED) Office of Teaching Initiatives. Provider #23567. This self-study activity will qualify for 2.0 Approved Continuing Teacher and Leader Education (CTLE) Hour(s), in the area of Pedagogy. Hours are based on full attendance. Board required certificates will be sent after the program. Florida Occupational Therapists & Occupational Therapy Assistant: PESI, Inc. is an approved provider with the Florida Board of Occupational Therapy. Provider Number 50-399. This self-study course qualifies for 2.0 continuing education credits. This self-study course consists of 2.0 clock hours of instruction that is applicable for physical therapists. CE requirements for physical therapists vary by state/jurisdiction. Please retain the certificate of completion that you receive and use as proof of completion when required. California Physical Therapists & Physical Therapist Assistants: PESI, Inc. is recognized by the Physical Therapy Board of California as an approval agency to approve providers. This self-study lecture qualifies for 2.0 continuing competency hours. Illinois Physical Therapists & Physical Therapist Assistants: PESI, Inc. is a Registered Physical Therapy Continuing Education Sponsor through the State of Illinois Department of Financial and Professional Regulation, Division of Professional Regulation. License #: 216.000270. This self-study course qualifies for 2.0 CE credit hours. New York Physical Therapists & Physical Therapist Assistants: PESI, Inc. is recognized by the New York State Education Department, State Board for Physical Therapy as an approved provider for physical therapy and physical therapy assistant continuing education. This self-study course qualifies for 2.4 contact hours. Texas Physical Therapists & Physical Therapist Assistants: This self-study activity is provided by the Texas Board of Physical Therapy Examiners Accredited Provider #2106032TX and meets continuing competence requirements for physical therapist and physical therapist assistant licensure renewal in Texas. This activity will provide 2.0 CCUs. The assignment of Texas PT CCUs does not imply endorsement of specific course content, products, or clinical procedures by TPTA or TBPTE. Full attendance is required; no partial credits will be offered for partial attendance. Canadian Psychologists: PESI, Inc. is approved by the Canadian Psychological Association to offer continuing education for psychologists. PESI, Inc. maintains responsibility for the program. This program is approved for 2.0 self-study continuing education hours.